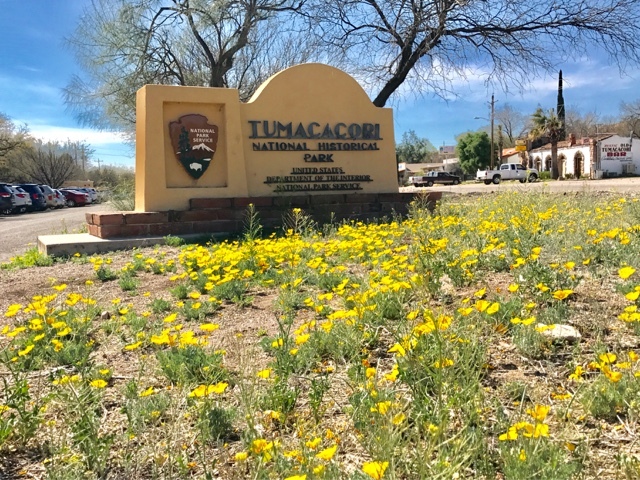 While at Pena Blanca Lake I decided to check out Tumacacori about 25 miles away. It has been on my list to see for some time. I was assured last year that a visit wouldn't disappoint. 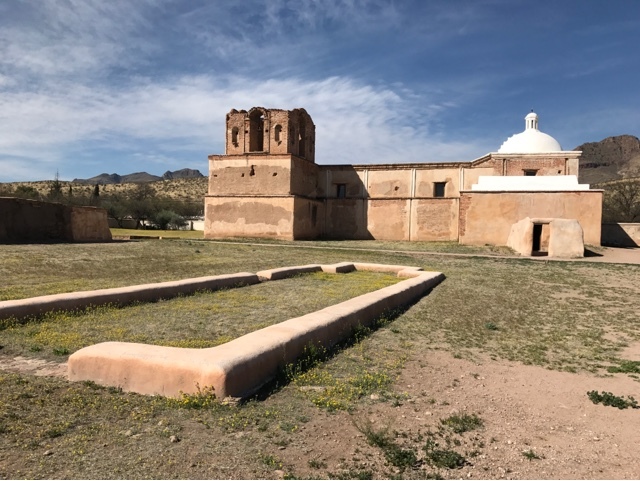 If you don't normally check out National Historical Sites or Monuments you should consider checking places like Tumacacori out. 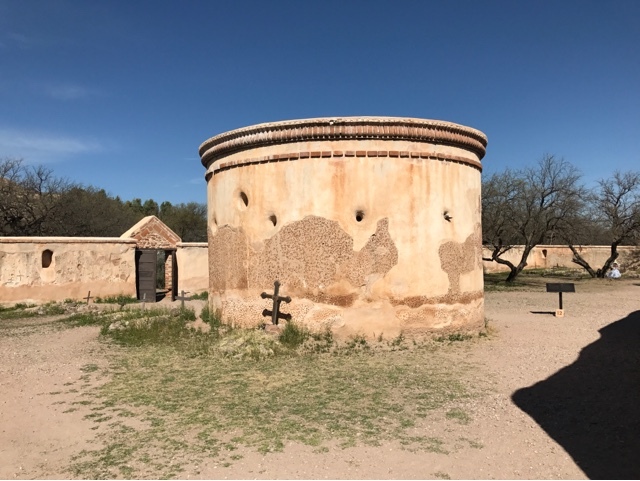 After being instructed on how to pronounce Tumacacori, the woman who checked me in, from Paxton, MA, (town near where I live) explained that this site is one of the chain of Spanish Churches. Churches were built on the concept of community, bringing in local Indians and teaching them cultivation farming practices. 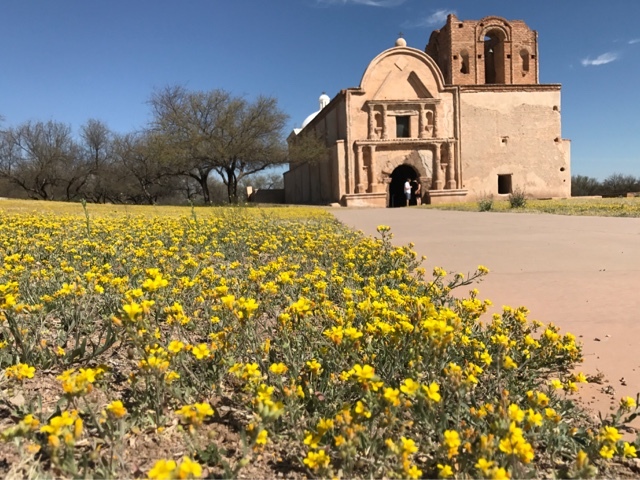 There was a lovely yellow wildflower bloom accenting the church grounds. I'm always attracted to architecture and the early Spanish work is no exception. Sometimes the photo you take looks more impressive than you first thought. The above picture was that way for me with the wonderful clouds and blue sky. 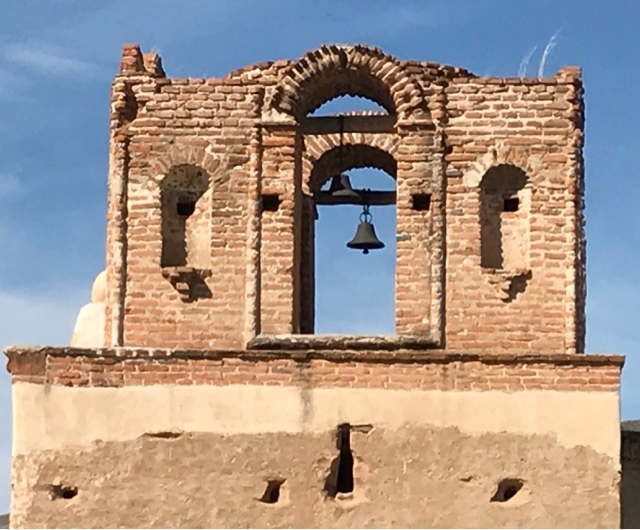 The bell tower was never completed, but there is a simplistically to the unfinished work and the single bell. 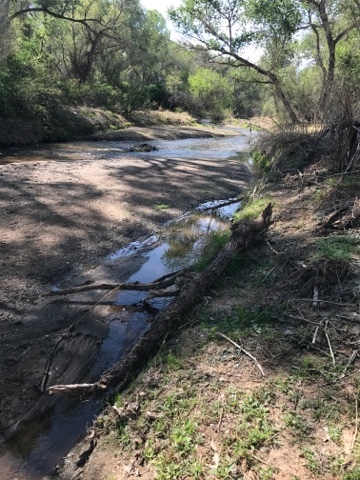 The Santa Cruz river a half mile away from the church compound was the source of life. 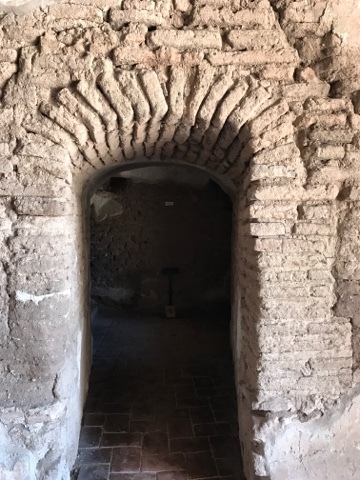 I went looking for a well and found out that water was diverted from the year round flowing river for irrigation and for drinking. This is the cemetery and the round building was a chapel that wasn't finished. The holes that remain in the walls were for scaffolding that would have been used to build a roof. There were two local Tohono O'odham Nation Indians performing demonstrations. A man was making wire baskets. We struck up a conversation about his work and he told me he has done baskets in the Smithsonian. A woman was making corn flour tortillas and giving samples with beans and salsa. It was a nice morning snack. It takes about two hours to watch the 20 minute movie and tour the grounds with the self guided book.